This is the second in a 7-part series comparing Sun Tzu’s The Art of War to youth wrestling and how we can apply these lessons in our own lives. The kids toe the line and shake hands. Once ready and in their stances, the referee blows the whistle to begin the contest. Having never faced each other before, both the boys have options. What they choose to do is based on experience and comfort level. Not knowing the other’s skill level, to shoot for a takedown from distance could be disastrous. If you can’t touch your opponent, the long shot truly lives up to its name in its chances for success. Charging blindly into an unknown opponent is a recipe for disaster. There is a small chance you may surprise him with an opening bull rush, however an experienced opponent will have prepared for such a scenario and will be able to counter with ease. What is a better solution? It is better to probe for weaknesses and to look for the opportunities provided by your opponent. It is foolish for a lawyer to cross-examine a witness with statements. Isn’t it better to ask questions? The more questions, the greater the chances of finding a flaw in the testimony. You can take control of a meeting by spouting off all the things you know without getting feedback, but this will not solve the problem at hand. The meeting participants are not the enemy. The problem is the enemy. To find the solutions you have to ask questions. You have to probe. You have to collaborate. The solutions to the problem will eventually be exposed, and then you can attack. If the enemy is within, what should you do? How can you attack a problem if you don’t really know what it is? Whether it is a medical condition or a bad habit, the methods of combatting it are similar. Identify the problem. Ask the questions that can lead to a solution. If you can’t find the solution on your own, collaborate. 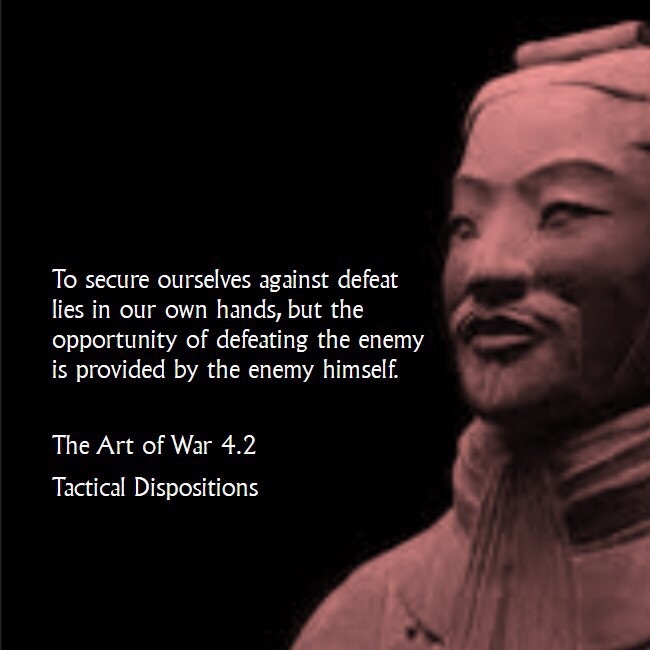 As Sun Tzu said, “To secure ourselves against defeat lies in our own hands.” It is in your hands whether or not you choose to fight. Only through fighting will you be able make use of the opportunities provided by the enemy. There are some things you won’t be able to cure. In that case, your only option is to live the best life you can. You do not have to be the victim. You can rise above and not allow the enemy an easy victory.